These are the words of panic uttered, in some form or another, by every poor, unlucky sap in every town around the world, when a worst-case-scenario rears its ugly head. Going back to the beginning of time. And they are the words that came spewing out my own mouth last week as the most fun gadget I’ve ever had literally flew out of my life, never to be seen again. Dammit, I lost my drone. A week earlier, the frantic mess of CES 2014 fading in the rearview, I finally had the time and wherewithal to open the box of goodies graciously sent to me by Horizon Hobby. 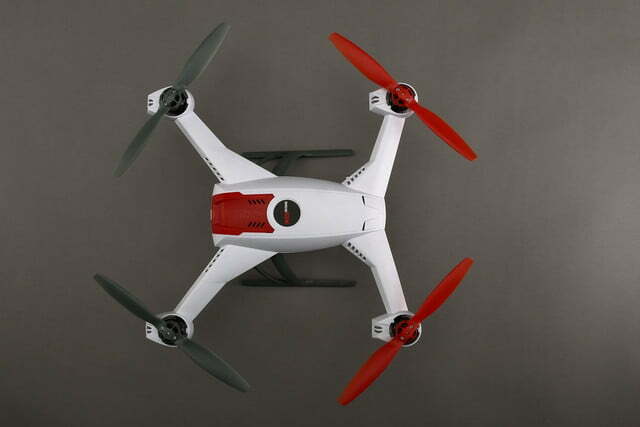 Inside, I found the impressive Blade 350 QX quadcopter, its red and grey propellers just itching to spin. Also included in the box was a press kit, a Blade 350 QX t-shirt, a beefy Spektrum DX5e controller, extra propellers, a couple of battery chargers and – what’s this? – a freakin’ GoPro Hero3 with a remote and other assorted goodies! I couldn’t believe that I’d let this fantastic contraption just sit in my house, unused and unloved, for weeks before finally busting it out. In a rush, I slapped the provided 2,200 mAh battery onto the charger, and put together the Blade’s handy anti-vibration GoPro mount, which is slightly tedious work, but absolutely necessary for the total blast I knew I was about to have. Unlike some small personal drones, the Blade 350 QX requires very little assembly, and only enough DIY know-how to fit a few tiny screws into some holes to mount the aforementioned anti-vibration GoPro plate. By the time the battery had reached its full charge, I was ready to soar. 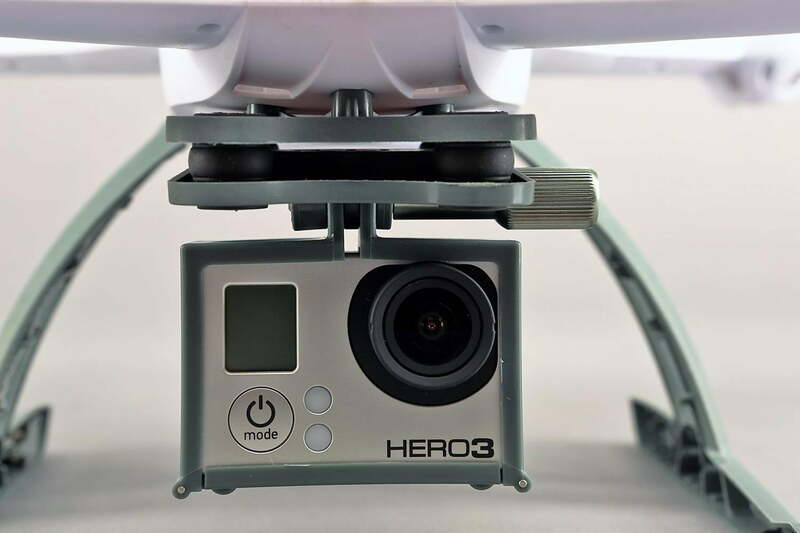 As far as attaching the GoPro is concerned, you have two options: Attach the camera using the provided case – a rather flimsy box of plastic that gets the job done – or use the waterproof GoPro housing that came with the camera kit. 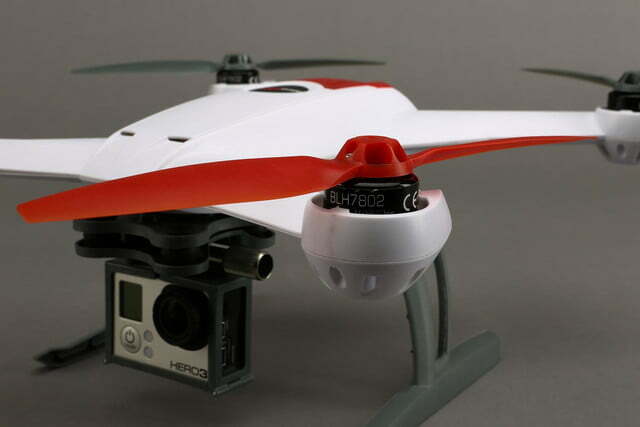 For my first flight, I slapped the GoPro in the Blade’s camera mount, and headed outside. Luckily for me, I live on a hay farm with acres upon acres of rolling grass fields. Across the street is virtually nothing but corn fields (without corn, this time of year), and even more hay fields. And while a relatively busy country road runs in front of my house, there are only three houses, including my own, within roughly a half-mile radius of my farm, and only a smattering of trees. 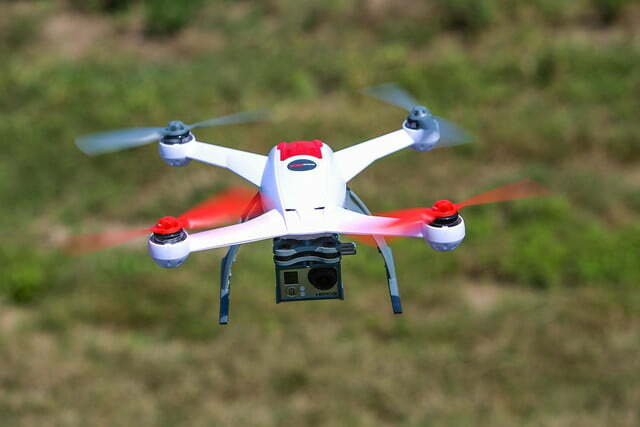 In other words, I live on the perfect spot to test small drones like the Blade 350 QX. And, for reasons we’ll get into later, I highly recommend that anyone planning to get into drones find a similar setting to start flying. The Blade 350 QX has three flight modes, which you can switch between using a toggle switch on the GX5e controller: Smart Mode, Stability Mode, and Agility Mode. The Blade fired up like a well-tuned German fighter jet, and, with the flick of the elevator stick, it was in the sky. 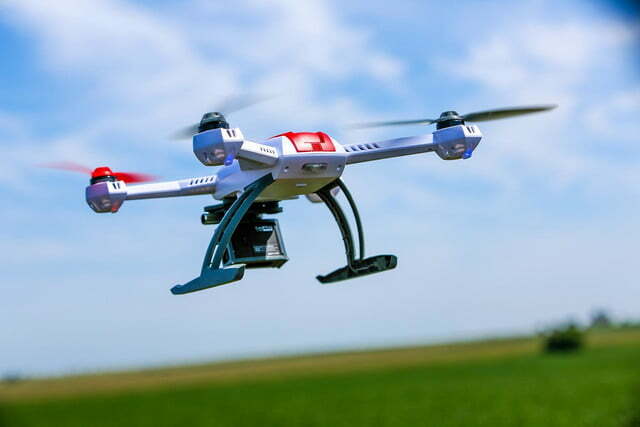 Smart Mode is for relative beginners, as it uses the drone’s built-in GPS to establish a 30-foot diameter “SAFE Circle” around the pilot, so you don’t take out an eye with the high-speed propellers. 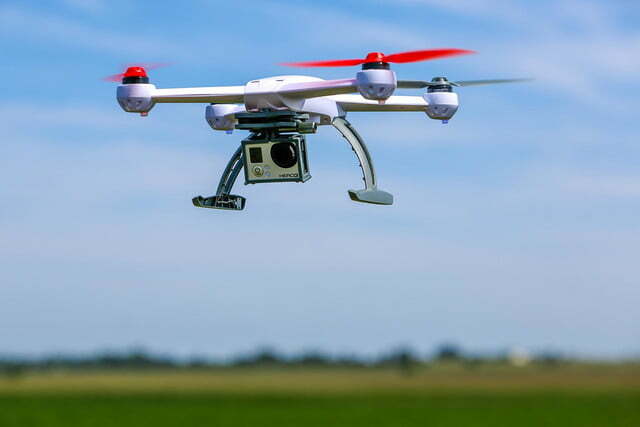 It also limits the amount of pitch and roll the drone will take when flying, as well as “stick relativity,” which means the drone always goes right when you hit right on the control stick, no matter which direction the drone is facing. These features help keep things from getting out of control. 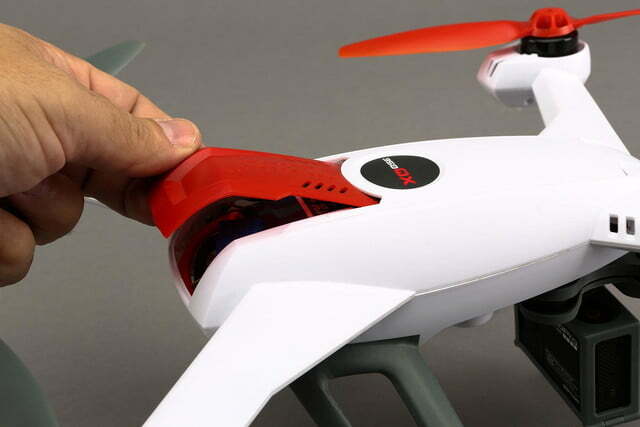 And, if they do, you can simply flip a switch on the controller to activate the “return-home” feature, which automatically causes the Blade 350 QX to autonomously fly back to the spot from which it took off. 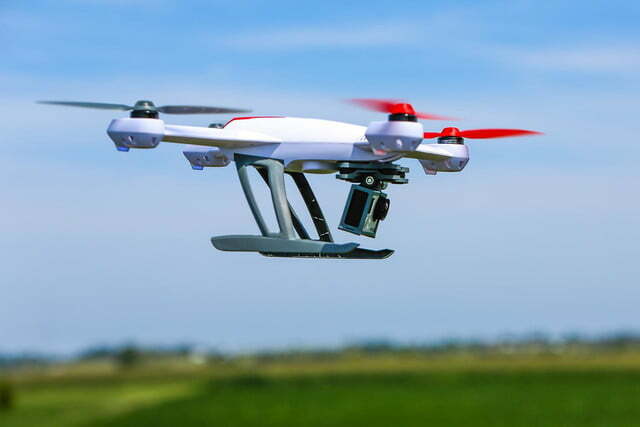 Stability Mode is all about aerial photography. 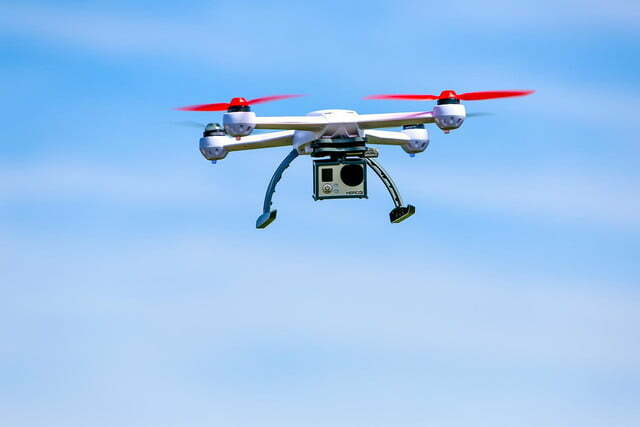 It allows for more advanced flight, but does so with photographers in mind by keeping the pitch and roll angles more stable and allowing the Blade to fly above the 45-meter altitude limit that’s enabled in Smart Mode. And finally, you have Agility Mode, which is recommended for advanced pilots and allows you to do dips, flips, and all sorts of acrobatic flight maneuvers. While I have a good bit of RC helicopter experience, and have flown other drones, I didn’t dare get into Agility Mode until I had a good number of flying hours under my belt. In the end, I never did. If flying the Blade 350 QX is fun – and, holy crap, is it fun – then recording high-definition video from 150-feet in the air is downright orgasmic. I am no photographer, nor have I ever been much into shooting videos just for fun. But the Blade-GoPro combo changed all that. I couldn’t get enough. Every chance I had, my dog and I would head outside to get just one more shot. I was – am – addicted. As I switched between Safe Mode and Stability Mode, tested out the controls, and got really comfortable with the Blade’s handling, I shot countless gigabytes of video. Which is to say, if you’re considering getting the Blade – and you should, it’s awesome – you definitely need to pick up a GoPro as well. It’s just not the same without it, in my experience. 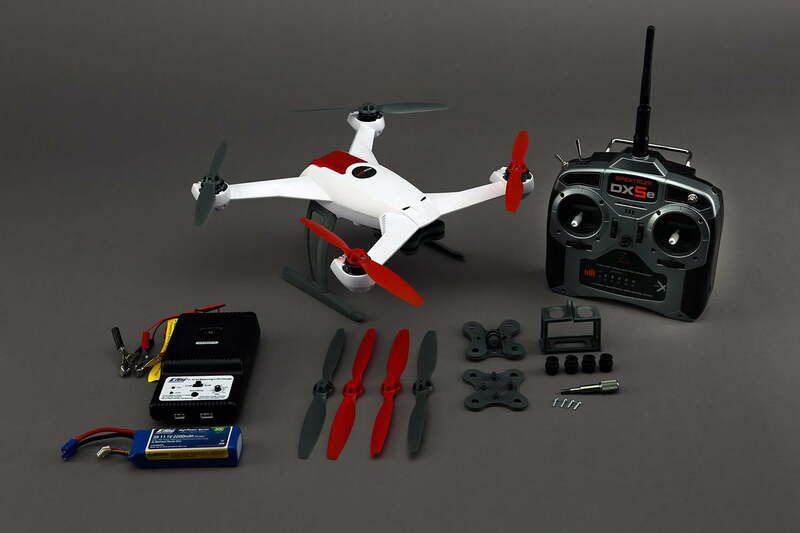 Of course, that will add another $300 or so on top of the $470 for the “ready-to-fly” version of the Blade 350 QX, but it’s totally worth it. After days of testing out the Blade 350 QX (and, let’s be honest, having a great time doing it), I decided to take it out for one last test of the return-home feature, and to shoot some photos for this article you’re reading. To respect the only close neighbors I have, I took the Blade to the far side of a barn on my property, at the edge of a giant field. A light snow had started, and I knew I had to make this quick to avoid getting any nasty moisture into the drone. In that instant of misfortune, I completely lost sight of the Blade. That’s when I freaked out. As always, the Blade fired up like a well-tuned German fighter jet, and, with the flick of the elevator stick, it was in the sky. For this test, I wanted to see just how well return-home worked from a relatively high altitude – not to the 45-meter limit, but close. With barely any wind, I sent the Blade higher and higher into the sky. Soon, however, it began to drift farther and farther away from me. I hit the elevator stick down, but the Blade wasn’t descending fast enough. Suddenly, it seemed, this once-magnificent gizmo reduced to a tiny white dot in the sky. I tried to maneuver it closer, but it seemed stuck in a draft of wind that I couldn’t feel back on the ground. To my horror, I realized that I was no longer in control. Panicked, I hit the “trainer” switch on the GX5e controller to initiate the blessed return-home feature. But by some fluke, some hideous trick of the gods, the damn switch broke off. Literally, it snapped off in my fingers and fell into the grass right at the exact moment that I needed it to work. Thoroughly freaked out and in no shape to drive, I jumped in my trusty Honda Civic and began blasting around the neighborhood in search of the Blade. Saggio, my German Shepherd, sat in the back seat, nervously whining just audibly enough to send a man into an asylum. After three hours of driving my neighborhood’s two streets, tromping through every field I could without too much trespassing, and feeling like a complete and total fool, I called it quits. 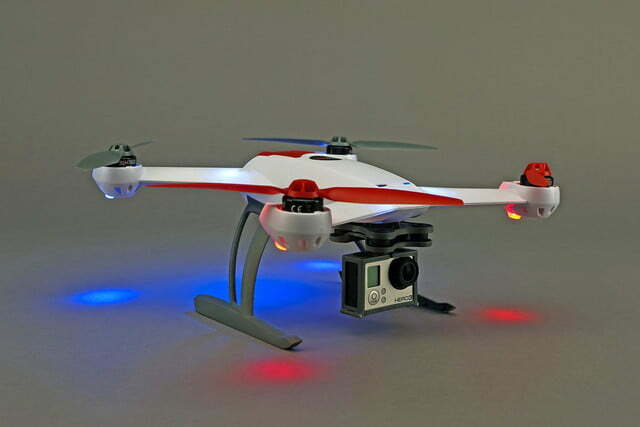 The Blade 350 QX, the GoPro Hero3, and that damn trainer switch – all were lost. In their place: Regret. Flyaways, as they’re called in the RC aircraft world, are not uncommon. 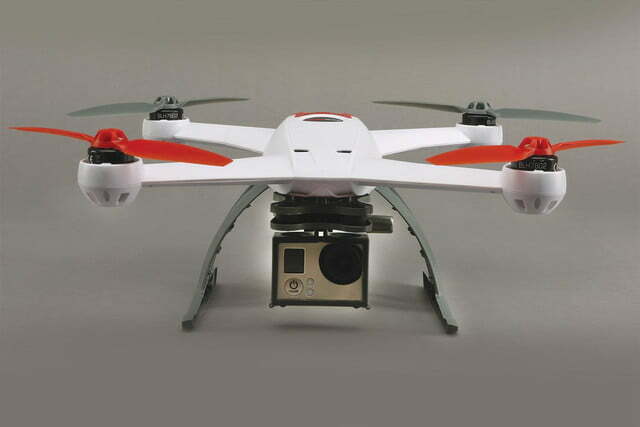 It’s one of the first things you’ll come across if you start researching personal drones. 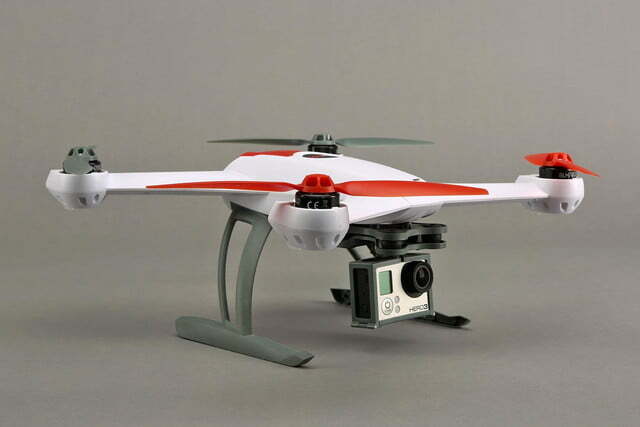 But the Blade 350 QX is not known for flyaways. Steve Petrotto, Horizon Hobby’s brand manager, tells me it only happens to “about 1 percent” of each of the company’s RC vehicles. So, is that what happened to me? Did my trusty Blade 350 QX abandon me? Did its robot brain get fried from high-altitude air? The answer is, we’ll never really know – not unless I still manage to find the thing. Which I am trying to do. (I even got up in the middle of writing this to go look for it one last time.) What can happen, according to Petrotto, is that the GPS loses connection, or the compass gets out of sync. Properly maintaining these crucial components is key to staying in possession of your Blade. In the end, Petrotto confirmed what I suspected: I am simply not a good enough RC pilot to be flying these contraptions high in the sky. Yes, the return-home button snapped off at a particularly inopportune moment. But, were I more experienced, I would have never put the Blade in that situation in the first place. Yes, accidents happen. And this was an accident. But it was also just a stupid mistake. 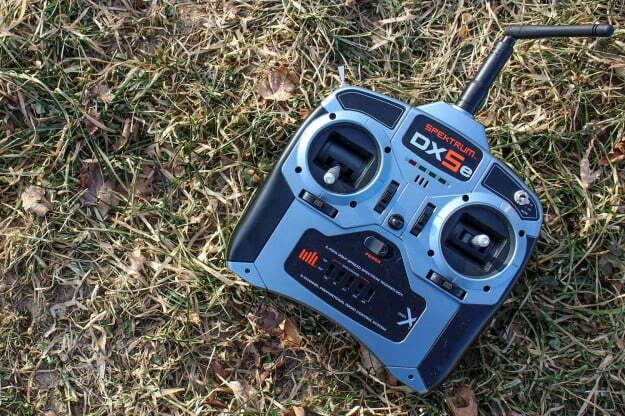 So, here’s to you Blade 350 QX. You were a fantastic gadget friend for the time I knew you. You gave me some of the most thrilling fun I’ve ever had outdoors. Thank you for not killing a bus-load of school children. You will be forever missed.